These days, however, the group is training its limited digital firepower at Republicans as often as at Democrats. 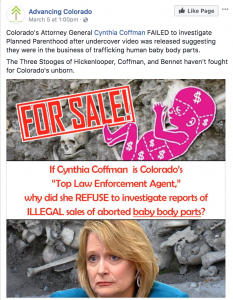 Recent targets include the highest-ranking Republican in the state, Attorney General Cynthia Coffman, who has declared her candidacy for the governor’s race. 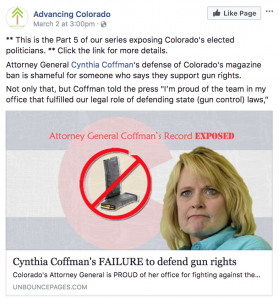 A number of posts claim to be part of “ a series exposing Colorado’s elected officials” but all five take swings at one target: Cynthia Coffman, hitting her on red-meat issues like choice, guns and taxes. The group has also attacked State Sen. Kevin Priola (R-Brighton) over his support of electric vehicle incentives. 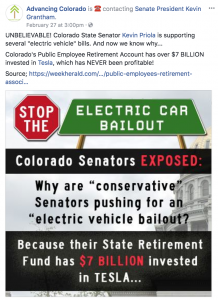 It claims that Priola and the other senators’ motive for supporting the incentives was that the Public Employees Retirement Association (PERA) has “$7 billion invested in Tesla.” The cited source, however is a Week Herald business article stating that PERA’s Tesla holdings total $7,666,000. That’s million, not billion, out of a fund totaling approximately $48 billion, with a real “B.” Had PERA really invested a seventh of its total value in Tesla the group may have had a point, but given that the percentage is actually one thousand times smaller, it’s an absurd argument. Fact-checking and basic math aside, this shift from establishment outlet to inter-party attack dog is most likely explained by the brand’s new management. Advancing Colorado is now represented by Brandon Wark, Project Coordinator at political consulting firm Rearden Strategic. Rearden’s office in Golden shares its address with Advancing Colorado. The firm’s president is Joe Neville, son of Senator Tim Neville and big brother to House Minority leader Patrick Neville. Joe is also the former political director of the far-right gun group Rocky Mountain Gun Owners. According to LinkedIn, Mr. Wark is a former employee of both Senator Tim Neville (campaign staff) and RMGO President Dudley Brown, having worked for Brown’s other entity, the National Association for Gun Rights. RMGO’s disruptive influence on state politics has been well-documented. Founder Dudley Brown, once labeled a “political terrorist” by a GOP state legislator, has built a lucrative business attacking Republicans from the right on gun policy. The Neville family members are direct beneficiaries of his scorched-earth tactics, whether as employees (Joe) or as elected officials supported by RMGO (Tim & Patrick). Ultimately however, the chamber voted 52-9 to expel Lebsock. Only eight of the 24 other voting members of his caucus joined Neville in opposing the expulsion based on disagreements with the process. 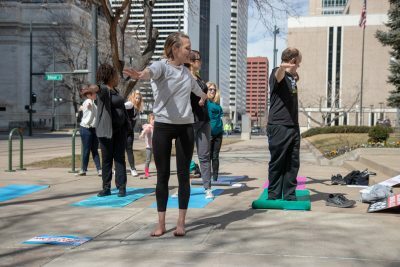 While Advancing Colorado’s messaging strategy failed so far as the Lebsock expulsion vote, we’ll have to wait until the GOP assembly in April to see whether its attacks on Cyntha Coffman prove effective.